Shuggie Otis is scheduled to play at the 24th annual Byron Bay Bluesfest, Australia’s premiere blues and roots music festival. You can see the full lineup and buy tickets to the festival on the Bluesfest website. Before Prince was Prince, there was Shuggie Otis. The son of legendary bandleader Johnny Otis was a musical prodigy — a gifted multi-instrumentalist who was playing in his father’s big band by the age of 13. Otis’ 1971 album Freedom Flight and his 1974 follow-up, Inspiration Information, a chill collection of songs influenced by blues, prog and psychedelia that was so far ahead of its time its commercial failure made Otis’ decision to drop out of the music business for over a decade easier. A few years later The Brothers Johnson had a hit with the Otis-penned “Strawberry Letter 23” from Freedom Flight, but record labels didn’t want to sign the author of a platinum-selling single. He doesn’t tour often, but when he does, Otis is worth checking out. This is cause to give you plenty of advance notice of his April 17, 2013 show at Lincoln Hall. 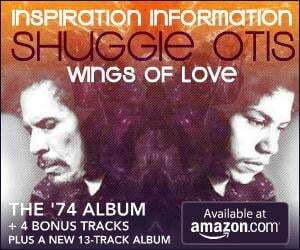 Cult R&B artist Shuggie Otis is prepping a new version of his essential 1974 album Inspiration Information that will include four previously-unreleased bonus tracks. More excitingly, the album will be coupled with another record, Wings of Love, which features 14 tracks recorded between 1975 and 2000 including songs from Inspiration Information’s follow-up which never saw the light of day. Look for that in April, 2013 on Epic/Legacy Recordings. Shuggie is playing a few shows this year but will launch a proper tour around the release of the CD. Read more at Brooklyn Vegan. Deluxe 2-CD package available everywhere April 16, 2013, through Epic/Legacy; European shows scheduled for Nov. 20-Dec. 1st; Dec. 5th at Echoplex in L.A.
Shuggie Otis is a musician’s musician, a reclusive genius from Los Angeles whose name has been spoken in reverential tones by his peers for more than four decades. After a long absence, Shuggie returns as a concert headliner on “The Shuggie Otis Rite” tour with dates in Europe followed by a rare appearance at the Echoplex in Los Angeles on December 5. Tickets are on sale now. Although an accomplished multi-instrumentalist, Shuggie is best known for writing “Strawberry Letter 23,” a #5 Pop hit for The Brothers Johnson in 1977. He has also garnered praise for his guitar skills on projects with Al Kooper, Frank Zappa, Etta James, and Bobby “Blue” Bland, among many others. Several songs from Inspiration Information have been sampled on pop hits such as Outkast’s “Ms. Jackson,” Beyonce’s “Be With You” and “Gift From Virgo,” and the list goes on. Under Shuggie’s personal supervision, his highly-acclaimed third and final solo album, 1974 ‘s Inspiration Information, will be released as a double-CD set on April 16, 2013, through Epic/Legacy, a division of SONY MUSIC ENTERTAINMENT. INSPIRATION INFORMATION / WINGS OF LOVE will feature the original Inspiration Information album alongside four previously-unreleased bonus tracks on disc one, while the second CD, titled WINGS OF LOVE, is an unreleased follow-up album which includes 14 unreleased live and studio tracks recorded by Shuggie between 1975 and 2000. A complete track listing for both discs will be released in the weeks to come. Here are full details of Shuggie’s upcoming concert dates: Nov. 20-21st at the Jazz Café in London; Nov. 24th at La Bellevilloise, Paris; Nov. 26th at Trix, Antwerp; Nov. 27th at Gruenspan, Hamburg; Nov. 29th at the North Sea Jazz Club, Amsterdam; and December 1st at the Sugar Club, Dublin. Four nights later on December 5th, Shuggie will play a homecoming date at the intimate subterranean Echoplex venue in L.A.’s Echo Park area. Go here for more info.